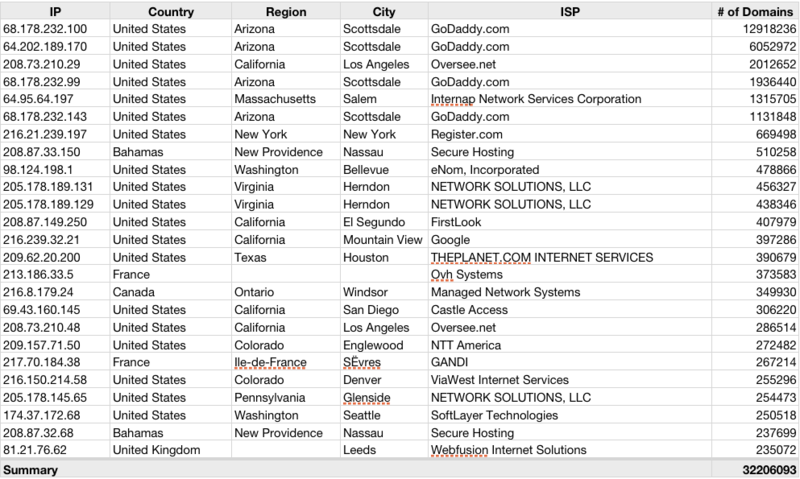 The past two information gathering runs showed that GoDaddy is the world largest ISP, but I was curious who else falls into the “Top ISP” category as determined by consumer shopping habits. To do this I’ve used my resolved IP database of 124 million domains and an ISP database from MaxMind. The results are pretty interesting, and it clearly shows that a small number of ISPs are definitely doing something right, which is causing many consumers to vote with their dollars in those ISPs favor. As usual the information is shown in graph form, to filter down the data to just the large providers I’ve set a minimum at 100,000 domains, leaving me with just 122 ISPs. The image below shows the break-down of the Top 25. If you click on it, you will be able expand the chart to 50,100 or the entire list in a form of a bar chart, or explore the pie chart that includes %s. Since we already know GoDaddy is #1, I will skip them over them and focus on the next largest 3. At #2, we have The Planet, a Texas based data-center provider with 6.1 million domains (4.91% of total). It should mention that The Planet had recently merged with Softlayer Technologies, #8 on our list, which would further expand their prominence by another 1.8 million domains. At #3 we have 1&1 Internet, a German ISP with 5 million domains (4.04%). And finally at #4 we have Internap, an Atlanta based ISP with 2.88 million domains (2.32%). 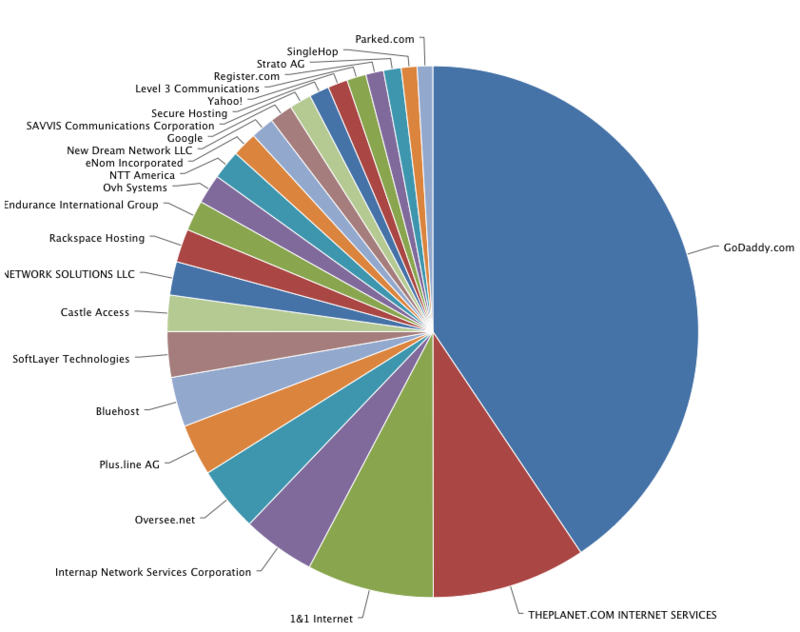 In total, the 25 largest ISPs represent 52.3% of all the domains, which quite impressive since overall there are 31,173 distinct ISPs. Even within the top 25 things are not entirely even, only the first 15 can claim over 1 million domains. Expanding the ISP list to Top-50, expands the domain coverage to 59.67%, not a whole lot. However once the entire list of ISPs with >100k domains is considered we are looking at 68.9% representation. This means that 2/3 of the entire internet is effectively managed by only 122 companies. Kinda scary, actually. When it comes to IP addresses, GoDaddy is by far the most frugal, which probably relates to the fact that they do a lot of domain parking. Both #1 and #2 on the list belong to GoDaddy, representing 12.9 million and 6 million domains respectively. I should mention that #4 with 1.9 million domains and #6 with another 1.1 million domains also belong to GoDaddy. Based on this information it would seem that GoDaddy’s prominence in the ISP space is predominantly based on parked domains, which take up 22 million of the 26.4 million being hosted with them. This can probably be attributed to GoDaddy’s extremely aggressive pricing when it comes to buying domains. The 3rd most popular IP address belong to Oversee.net, with just over 2 million IPs. Given that Oversee.net only has 2.57 million domain under management, it would seem that most of them are parked domains, same situation as with GoDaddy. Couple of other big IPs worth noting are 64.95.64.197, which belongs to Internap, with 1.31 million domains resolving to it. Given that Internap hosts 2.88 million domains, it seems just shy of 1/2 of their domain base is parked. Another “winner” is 216.21.239.197 which belongs to Register.com with 669k domains, which represents nearly the entirety of of the 703k domains at that ISP. Unsurprisingly Network Solutions is in the same boat, of the 1.32 million domains under management, 1.15 are parked on 3 IP addresses. On a general note, the 124 million domains are hosted on just 5.39 million IP addresses, which raises interesting questions about IPv4 exhaustion, clearly domain hosting is not the reason. So what the heck are people using those public IPs for? If they are being used by Internet Providers to provide internet to consumers, one would think that more extensive use of NAT would certainly alleviate the IPv4 shortage for quite some time. There are some 81,164 IPs that have over 100 domains resolve to them, if combined, their total domain count reached 87.4 million, 70% of all registered domains. Since It is safe to assume that in most cases virtual hosting won’t have more then 200 sites per IP, than based on the gathered data, 81.4 million domains are parked on 37,865 IPs. This in turn means that 2/3 (65.4%) of all domains are not actually in-use. A number very similar to the % of domains hosted the world’s Top ISPs, so perhaps the things are not so bad after-all and the non-parked domains are more evenly distributed than the initial numbers might suggest. great job!I hope in future we will see more quality article like this one. Cheers. What ever happened to tfbm.org? One day the site just disappeared. All the data and posts are missing. It was hosted but prohost.org.